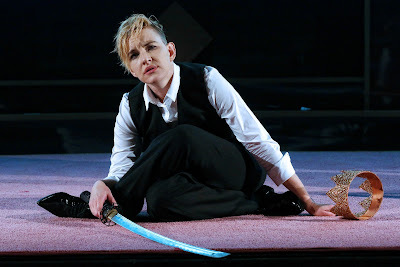 I first heard that a woman would be playing Richard in Bell Shakespeare’s new production of Richard III (rebadged by the company as Richard 3) via an article the title actor Kate Mulvany wrote for The Age back in February. Her casting was fascinating not only as a woman intending to play Richard as a man, but because Mulvany herself has a severe spinal malformation resulting from treatment for childhood cancer. Shakespeare’s King Richard III, with his hunched back and withered arm is not precisely the Richard of history, as we know from the discovery of his remains in recent years. Many people also make good arguments that he’s a lot less evil than the Lancaster-adoring (and by association Tudor-adoring) play would have him. With this in mind, Bell Shakespeare’s production is a further step away from a play about history and embraces contemporary issues. In the micro view, it’s about a terrible person whom we learn has been vilified since birth for his physical malformation. Richard is a monster, with a mind as twisted as his body. But which came first – his malice or theirs? Did he grow up so cruelly scorned that he chose to become the monster they saw, just to get back at them? These are questions I always find fascinating about this play, and which were explored well in the London production starring Martin Freeman which I saw in 2014. Bell Shakespeare’s Richard makes these questions central to the characterisation of the king, where we see his actions but only hints of his motivations, beyond the fact he hates the world and deliberately chooses to be as vile as possible. He’s also charming, charismatic, ruthless and clever – or he’d never get away with what he does. He’s much cleverer than the people around him, who are riven by quarrels, rivalries, self-interest, petty ambitions and greed. They’re easy pickings for Richard to divide and therefore conquer. Despite his cleverness and gleeful treachery, Mulvany’s Richard is a lonely man, “deliberately unloved” as the actress said in her article. As villainous as he is, you can see bent Richard is either patronised or treated with utter contempt by his family. On this busy set Richard is forever surrounded by people, but almost nobody ever touches him, and rarely with any kindness. All the hands laid on him as he is declared king bestow on him a knowing glow. He’s tricked them all (and us too), and yet there’s a vulnerable joy for him in the contact. That’s not as heartbreaking as a late scene where he’s trying to find something to swear on that he hasn’t ruined, and Elizabeth hushes and holds him a way, it seems, he never has been. It’s much too late to save or forgive him by then, but that moment of fragility is profoundly affecting. 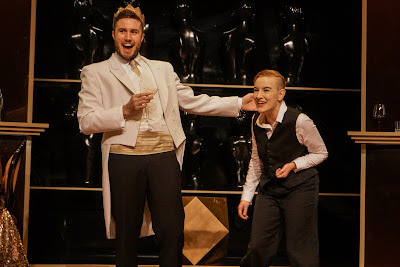 Mulvany plays Richard as a man, but the combination of her true gender and her own crooked back (revealed to our awkward discomfort at one point) add to the sense that this prince, descended from kings, is accounted less than fully human because of an accident of birth. The production that plays beautifully with the fourth wall, inviting the audience to egg Richard on as he slyly claws his way toward a crown. The cast make the most of the wicked humour and Mulvany is flawlessly, deliciously, blackly funny. But like many who have voted for someone who’ll shake up the system – and who perhaps have found entertaining, even when their utterances are demonstrably untrue and contradictory – there comes a time when the sociopath on the throne isn’t funny anymore. Despite achieving the crown and, it would seem, the love of the people, Richard can’t rest. Brutality follows brutality and the audience stops laughing. One particular death, shown graphically on stage, renders his previous sass and wit very ugly after all. I’ve spoken so much of Mulvany here, it’s obvious that she’s the linchpin of this production. She graces monstrous Richard with such humanity that even if you can’t forgive his grievous sins, you can feel compassion for him. Richard might hate the world, but nobody hates Richard more than Richard does. Her jewel of a performance is ably supported, although the remainder of the cast shine less brightly. Sandy Gore as Queen Margaret curses her enemies with great gravity and intensity, and James Evans’ Buckingham provides an excellent counterbalance in his scenes with Mulvany. There’s so much more to unpack, but it’s best to see it for yourself. Whether your interest is in the study of a very human man warped in soul and mind as well as body, or in the study of how power can be seized by the plausible from the complacent, you’ll be rewarded. 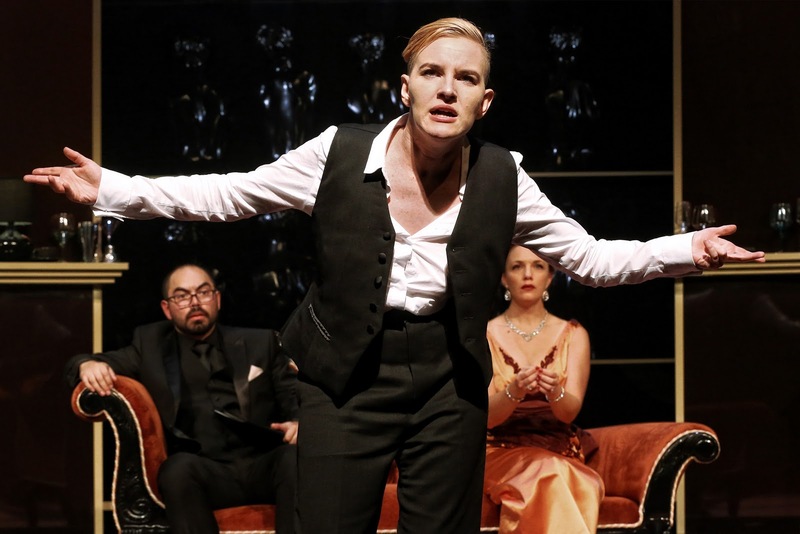 Whichever it is, the power of Kate Mulvany in the central role sustains the play. 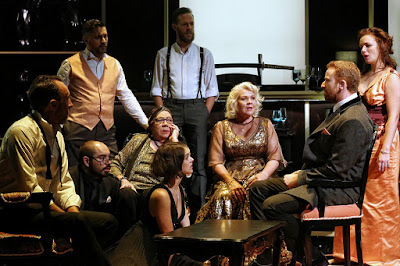 Melbourne audiences are rightly grudging with their standing ovations, so Mulvany richly deserves the one she was willingly given the night I saw her perform. Richard 3 runs to 7 May 2017 at the Arts Centre Melbourne; find details and make bookings here. For more about the Bell Shakespeare Company, visit its website. Want to sponsor a blog post or place an ad on my blog? Click here to download a PDF with the details. 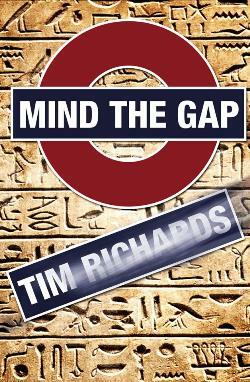 Freelance travel writer Tim Richards travels the world - to write about it. Discover his current whereabouts as he covers travel, destinations, and the little quirks hidden in overlooked corners. Finalist for Best Food Travel Story in 2015, for Aussie Cafes Take Manhattan. Winner of Best Travel Story under 1000 Words in 2016, for A Boy and a Coin. The Freelance Pro trustmark indicates a freelance journalist of the highest professional and ethical standards - click the logo to learn more. Poland 3: Baba Pruski Scores! 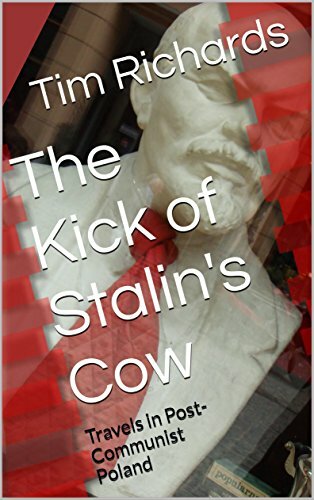 A fast-paced reality-bending adventure, published by Harper Collins as an ebook. Click the image to learn more. © Tim Richards 2008-2015. Powered by Blogger.